With today being bank holiday and the fact that its also half term the all new film from the creaters of Wallance and Gromit, Shaun the sheep and chicken run being released is perfect timing. 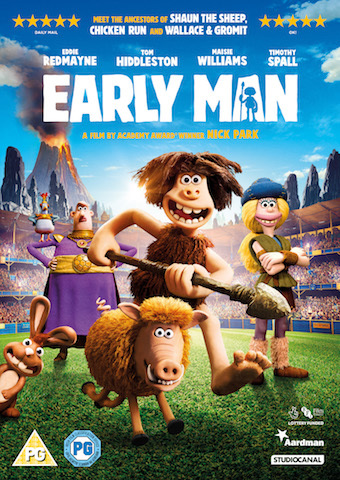 Early Man is a fun film to suit all ages so suitable for the whole family. Set at the dawn of time, when prehistoric creatures and woolly mammoths roamed the earth, Early Man tells the story of how plucky caveman Dug along with sidekick wild boar Hognob unites his tribe against the mighty Bronze Age in a battle to beat them at their own football game. The story goes back in time and shows how football was invented from a chance moment when a hot meteorite fell from the sky and landed on the hands of a caveman who tried to get rid of it and kicked it away. With giggles and laugh out loud moments along the way this is a great family friendly film and definitely sure to be popular amongst children and adults. We love the idea behind the story and I especially loved Goona as a character who's mission is to get women's football recognised. Dug and Hognob are also loveable characters who love to make us laugh. Tom Hiddleston is absolutely brilliant and almost unrecognisable in his French accent as the ridiculously pompous Lord Nooth, governor of the Bronze Age town.